The SKNLP in series of articles headlined: “Debunking Team Unity’s les and deception agenda” pointed to several inconsistencies during the recent press conference by Dr. Harris and previous news releases. Does Team Unity mean to say that the Environmental Impact Assessment, which they have been promising to complete since July 2017 will actually be done? Doesn’t an Environmental Impact Assessment have to take place before the land is cleared and design the plan? And doesn’t the law require an open and consultative process which involves the public before any decision can be taken? Does Team Unity mean to say that the drawings “will be brought to tender” now? At this stage when they have already signed a design-build Memorandum of Understanding with Innotech Services Ltd., the firm from Barbados that was contracted and paid EC$10 million to build the temporary facility at Taylors? So how does that actually work? First you sign the contract with the company you want, then you create a show that you are opening the bidding process to tender? Really? Then what becomes of the binding contract that they already made with Innotech? On May 25, 2017, Mr. Cromwell Williams, Director of Public Works visited the “site of the new Basseterre High School, Ponds Estate,” and reassured the public that the site had been “properly assessed and all checks have been carried out to ensure that the environment remains safe”. “We’ve just today presented a conceptual design for the government appointed technical team to review…What’s next is to get through that process in the next couple of months and see how quickly we can potentially get on site and see the new Basseterre High School under construction,” it cites Mr. DaSilva as saying. Accusing the Team Unity Government of insulting the intelligence of the people of this country and underestimate their ability to connect the dots and put two and two together, the SKNLP said the TUG needs to be reminded that universal free education at the primary and secondary level happened in this country in 1962 not 2002. “The fact of the matter is that Team Unity, led by Dr. Harris, could care less about the legitimate concerns of the citizens and residents of St. Kitts and Nevis about constructing the new Basseterre High School on the sensitive, protected area of the Basseterre Valley Aquifer. Team Unity made a campaign promise to build the school on the Aquifer, and this is where they intend to build it regardless of the science, regardless of the advice of local experts, regardless of the fact that the majority of Kittitians do not support. That most Kittitians are against it was confirmed by an online petition that was circulated by a concerned citizen where 650 people said that they were dead set against school being constructed on the Aquifer. This contrasted with the mere 150 people who signed the government’s copycat petition to “build a new school”, even though the petition that they circulated withheld the fact that they really meant to build the new school on the Aquifer. The SKNLP said this demonstrates that the people of St. Kitts and Nevis are seeing right through the government’s deceptive shenanigans and are well aware of their attempts to circumvent the laws of the St. Kitts and Nevis. 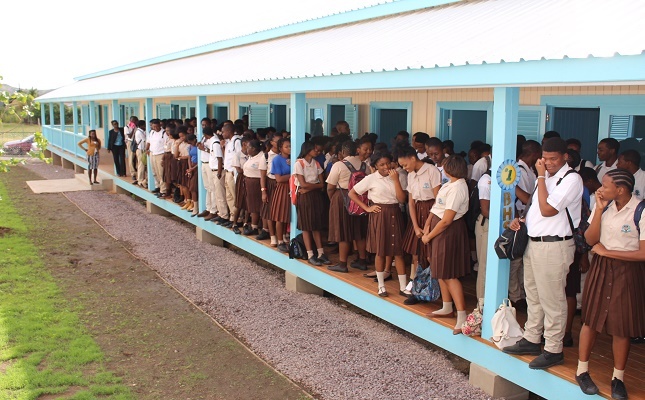 “The facts are that Team Unity intends to build the school on the Aquifer, with or without the consent of the general public, with or without an EIA and the contract to design and construct the new Basseterre High School has already been given away to a foreign company, thereby denying local architects and contractors the opportunity to compete in a transparent bidding process. The construction of the school on the Aquifer was always a foregone conclusion. Team Unity never intended to follow the process mandated by law under the Development Control and Planning Act (2001). The EIA that will be delivered in 15 days is just a sham and so is any tendering process that will follow.